Hey everyone, today I have some really cute glitter toppers to show you. Sadly I do not own any of them but I got to try them on my nails and that was good enough for me. I don't have the names of any of these glitters :( I walked into a store randomly and they had a nail polish testing section (awesome!) so I layered them over my nails that were painted with Essie - Play Date and they turned out brilliant. Index finger: a mix of red, dark and light blue, purple bar glitter and a rare gold hexagon. I love them all; I can't seem to pick just one! Also, isn't Essie - Play Date the best color to layer glitter over? Which is your favorite glitter mix? Don't forget to follow me on Twitter and Bloglovin! Hi, thanks for stopping by and leaving such a lovely comment. It's a gorgeous purple, isn't it? Thank you for linking up to Super Sunday Sync. Thanks for stopping by Rosey. Good choice! The black and white is pretty special. 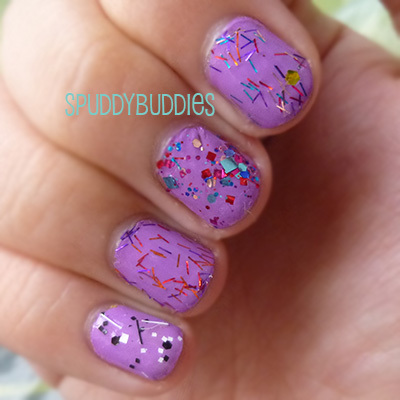 I love glitters, and I love the idea of a nail painting station to try out colors! Thanks Jennie! Isn't this the best lilac-ish base?! And I agree - that glitter bomb? Amazing! I wasn't sure I liked the black and white one until I put it on and was like WOW. DEfinitely! You and my sister would get along really well, haha! Thanks so much for stopping by! Oh, great tip!! Thank you so much- I'll be sure to do that next time! Same here with the taupe and blue tones! Thank once again!